We can’t believe its has been 6 months since we launched Mitchell’s Realty Hervey Bay ! Since launching our new business on the 5th of January 2016 we have proudly listed over 60 properties and placed 29 under contract ! We have experienced strong buyer interest in the last couple of months which went against expectations with end of financial year and a Federal Election being called normally suggesting a quite period. The extension announcement for the $12,000- “Destination Hervey Bay Grant” was also welcomed by those looking to purchase a new home in one of the eligible estate and an added bonus for 1st home buyers who also got a boost to $20,000- under the new 1st Home Buyers grant as well. 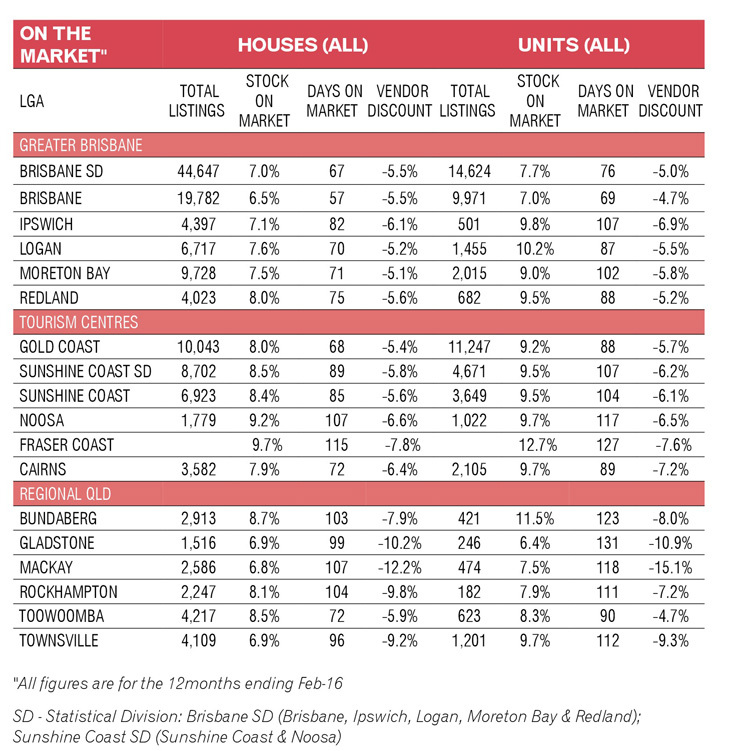 The March quarter has been slower throughout the state, although the overarching trends are continuing to hold steady, with small levels of growth in the southeast corner and more challenging conditions throughout much of regional Queensland. All figures for the most recent quarterly and yearly periods are preliminary only and subject to further revision as additional sales records become available (see Research Methodology online at reiq.com). 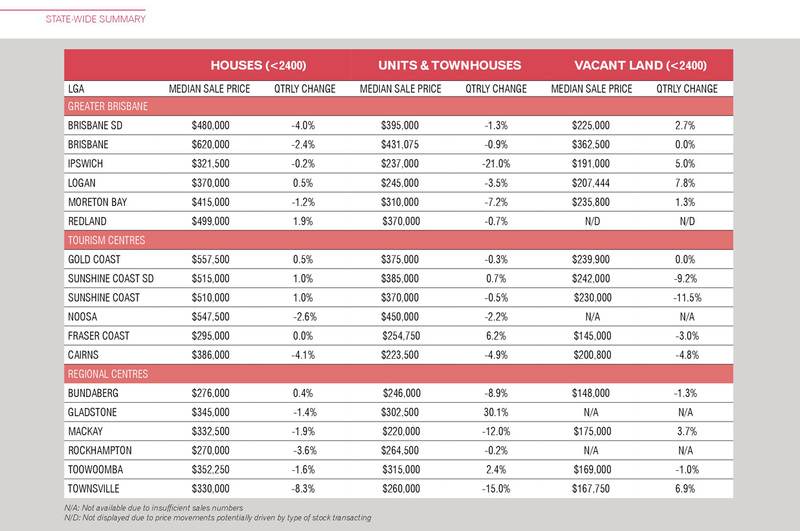 *Data supplied by CoreLogic July 2016. The house market was slower this quarter and seven out of 11 markets contracted. The Brisbane LGA median house price fell 2.4 per cent this quarter, but the longer-range trends are still positive, with 6.1 per cent growth over 12 months and 17.9 per cent over five years. 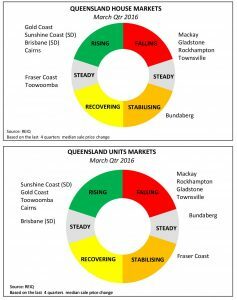 As forecast, the Townsville market has struggled this quarter and the impact of the nickel refinery shutdown is having an impact. 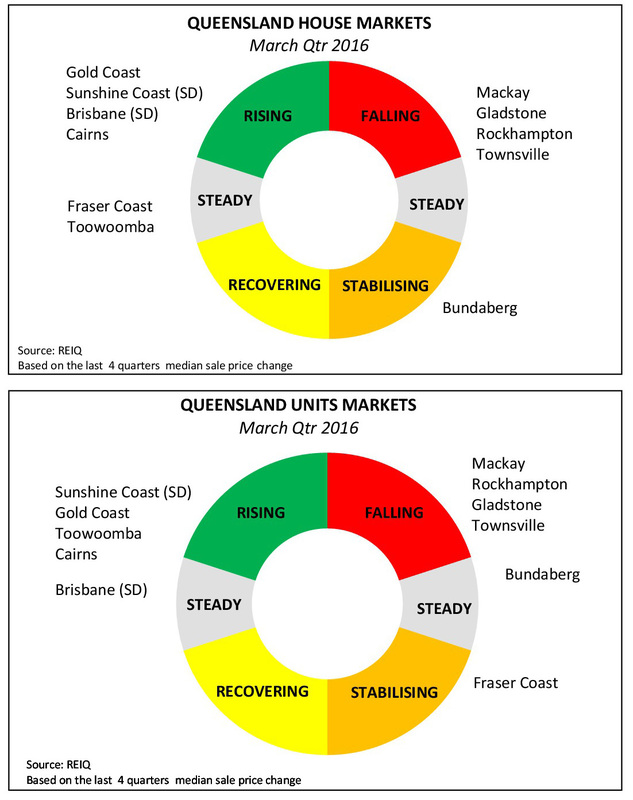 Even the strongest performing regional areas of the Gold Coast, Toowoomba, the Sunshine Coast and Cairns have slowed in the March quarter. Toowoomba remains one per cent above this time last year and almost 20 per cent better than five years ago, which gives this market some breathing room. With major infrastructure projects going ahead, and the condition that the workforce be drawn from within a 70km radius of the project, this market is in a good position and should see continued moderate growth. however it is 3.3 per cent higher than 12 months ago and 9.6 per cent higher than five years ago. With considerable infrastructure works and development activity under way in Cairns, our view is that this quarterly result does not foreshadow a broader trend. The overwhelming question on everyone’s lips when talking about the apartment market is, “Is Brisbane’s apartment market in oversupply yet?”. There is a significant level of apartment stock scheduled to reach the market in the latter half of 2016 and throughout 2017, however, some developers have reportedly held back projects and this will help smooth out supply levels. While the Brisbane apartment market contracted marginally, 0.9 per cent, it is still 1.2 per cent stronger than 12 months ago and 6.7 per cent stronger than five years ago. The inner city vacancy rate edged up slightly in the March quarter however, at 3.3 per cent remains within the healthy range and indicates demand for apartments and inner city living is steady. Throughout the rest of the state the apartment market was patchy. Small levels of growth this quarter for Toowoomba, Sunshine Coast, and Fraser Coast, were offset by falls in the Gold Coast, Bundaberg, Mackay, Townsville and Cairns. Rockhampton held reasonably steady, all things considered, falling just 0.2 per cent and still hanging onto positive territory in the five-year figures, at 10.6 per cent higher. 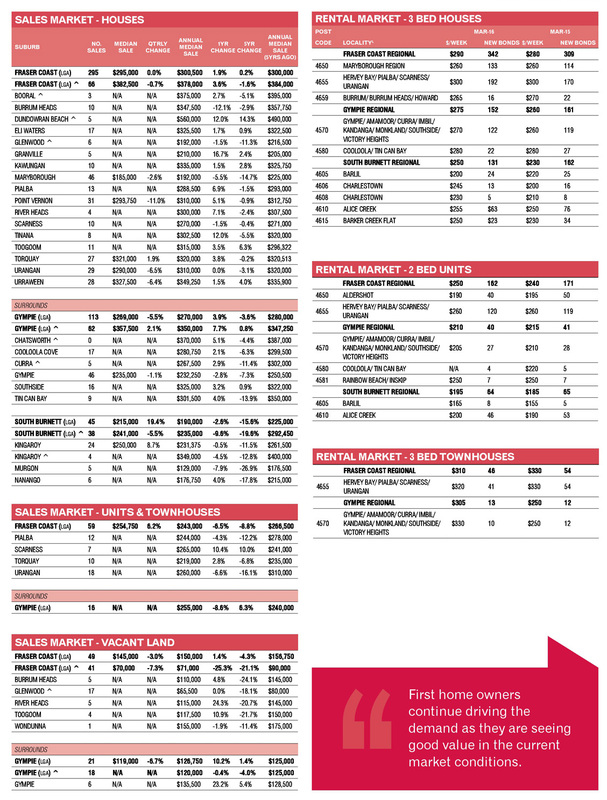 Gladstone returned an unusual figure of 30.1 per cent growth, but this is a reflection of several factors, including very little activity in the December quarter, along with the type of stock being sold in the March quarter – most likely more three-bedroom units compared with mostly two bed units in December. This data is not indicative of any market changes, but is rather, an outlier. Toowoomba was the star performer in the apartment market for the March report, with solid growth in the quarterly (2.4 per cent), annual (3.7 per cent) and five year (26.5 per cent) figures. First-home owners continue driving the demand as they are seeing good value in the current market conditions. 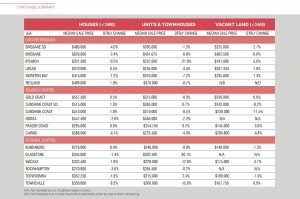 The median price for houses remained fairly stable over the March quarter while the unit median sale price showed a sharp improvement of about 6.2 per cent. The rental market remains relatively stable despite the increase in new housing stock. New large infrastructure projects in the area are limited and that is a concern for the long-term projection of the residential property market in the region. 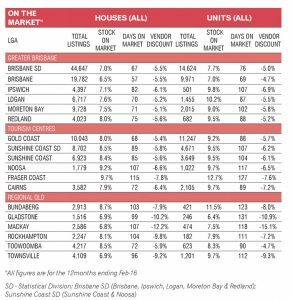 Overall, the house market remains steady while the units market may be stabilising in the Fraser Coast. The annual median sale price increased by almost two per cent from $295,000 in March 2015 to $300,500 in March 2016 and the volume of sales also reported an annual increase of about 8.3 per cent , or 120 properties. This increase has been driven primarily by the Great Start Grant in combination with the Building Better Region Grant. The latest is due to expire by the end of June 2016. The medium-term performance of the market has been steady with the median sale price staying at around $300,000. The largest volume of sales activity remains below $350,000. There is a portion of sellers having high expectations on property prices, which is actually driving large average days on market, which are now reaching close to four months. The vendor discount remains sitting between 7.5 per cent and 7.9 per cent. The annual median sale price for units has fallen by 6.5 per cent in 12 months and 8.8 per cent in five years. This slip has been driven primarily by the reduction in value of units located in five-star luxury resorts, which were a very popular construction around 2005. The market for this type of unit is very limited as the returns are low and the annual body corporate fees potentially fluctuate between $5,000 and $8,000. The unit market activity reported an annual increase in sales of about 61 more units, which is equivalent to an increase of 22.5 per cent. The volume of sales for units priced above $250,000 is scarce. The average days on market for units is about 127 days while the vendor discount increased from 5.7 per cent in February 2015 to 7.6 per cent in February 2016.
a two-bedroom unit increased by $10 in the March 2016 quarter, reaching $290 and $250 per week, respectively. Three bedroom townhouses reported a reduction of $20 per week. The rental market in Fraser Coast remains stable and the gross rental yields are sitting at around 5.1 per cent for both units and houses.